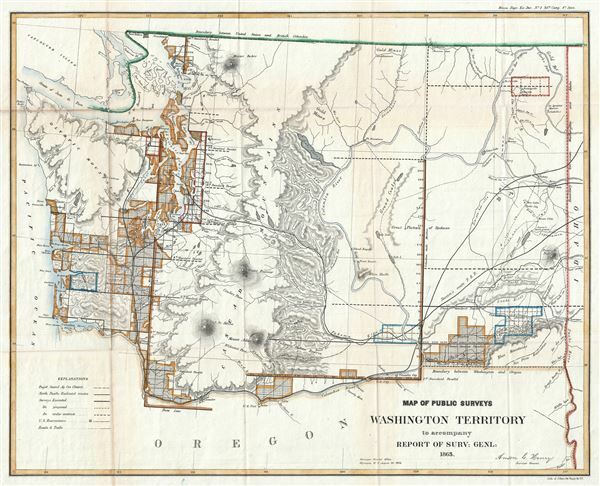 Map of Public Surveys Washington Territory to accompany Report of Surv: Genl: 1863. This is an attractive example of the 1863 public survey map of part of the Washington Territory prepared by Anson G. Henry, Surveyor General of Washington Territory. It covers the region from the Pacific Ocean to Idaho. It includes significant survey work throughout with the state of the land survey noted via a series of blocks representing the survey grid. An explanation in the upper right quadrant explains the various lines on the blocks. The map identifies the proposed 'Steven's Route' for the Pacific Railroad, as well as important roads and trails and the location of several gold mines. Several forts are noted, including Fort Okinakane, Fort Dallas, Fort Wallawalla, Fort Steilacoom, and Fort Colville among others. Various cities, rivers, lakes, mountains, islands and various other topographical details are also noted. This map was engraved by J. Bien and prepared for issue in the 1864 congressional report, Message of the President of the United States to the Two Houses of Congress at the Commencement of the First Session of the Thirty-Eighth Congress. Rumsey 1079.009. Wheat, Carl Irving, Mapping of the Transmississippi West, 1540-1861, 1089.